There are currently seven known bands and artists named Eva; (1) Eva's debut came in 2001 when Moni and September recorded their version of "Plastic Passion" appeared on "Prayers For Disintegration", a polish tribute to The Cure by Black Flames Records. 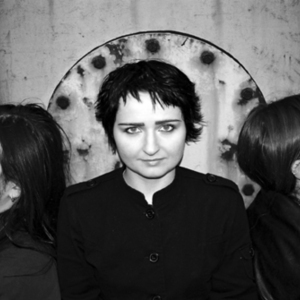 In 2002 Moni formally set up the band EVA with September (bass, programming) and Azyl (guitar) and recorded a 7 songs demo (in 2004 added another 2 songs). EVA's style is strongly influenced by early eighties coldwave. (1) Eva's debut came in 2001 when Moni and September recorded their version of "Plastic Passion" appeared on "Prayers For Disintegration", a polish tribute to The Cure by Black Flames Records. In 2002 Moni formally set up the band EVA with September (bass, programming) and Azyl (guitar) and recorded a 7 songs demo (in 2004 added another 2 songs). EVA's style is strongly influenced by early eighties coldwave. Their music may bring to mind such bands as The Cure, while Moni's extraordinary voice may remind you in some aspects of that of Siouxsie from Siouxsie and the Banshees. All of this is reinforced with a kick of raw punk energy, which flowed through the band during their lively concerts. Apart from numerous club gigs and a tour of Poland the band made many live appearances during The Cure fan conventions, and played on the most prominent gothic events in Poland such as The Cold Evening, The Temple of Goths, The Gothotheque, The Sounds of Cathedral, The Death Dizko. Eva also played during the Slovakian Batcave Party and the Lithuanian Menuo Juodaragis neo-folk darkwave festival. In August 2004, after the EVA's gig during the Castle Party Festival in Bolkow Moni decided to cut the band. Most musicians from the last lineup of EVA played with Nerve69 in the band Miguel and The Living Dead. In 2005 Moni aka Nanxu set up experimental electro band called Ersatz and recorded 3 songs. Since then the band reunited under the changed name of Hatestory. b](2) Eva is a singer/songwriter from The Netherlands. Her first album was called "Metamorphosis" and was relased in 2006 on her own Birdgirl Records label. Included was the song "Marry Me". A second album, "The Things a Girl Should Do", was released in 2007. For the last couple of years, Eva has been playing over a hundred shows a year in The Netherlands (The Music in My Head, Paradiso, Paard van Troje, Radio 3FM, Radio 5), Belgium, Germany, the UK and the USA (NYC, San Francisco, Texas). "A Long Way", Eva's new album, will be released December 2008. (3) EVA is a band from H?gan?s, Sweden, that has been together in various forms since the summer of 2004. In 2006 they started working on their own materials and had their first own gig at the Beach Party in H?gan?s 06. During that autumn they worked on their two tracked demo that they released in the first quarter of 07. In Oktober 2007 EVA released their first EP "Politicians and Musicians" with songs like "I Ran" and "The Author". Now they have just finished the recording of their second EP "Thgirla Si Gnihtyreve". EVAs sound can be described as a mix between Nine Inch Nails, Muse, Radiohead and a lot of own ideas. (4) Eva was also a small band from Lansing, Michigan that didn't last for long (and underwent three name changes). The then high school students handed out burned cds of demos that really didn't spread too far beyond their friends and regulars at concerts. (5) Eva is Lithuanian pop and pop rock singer. (7) Eva is a Italo Disco project who only recorded two songs in 1987.